1. 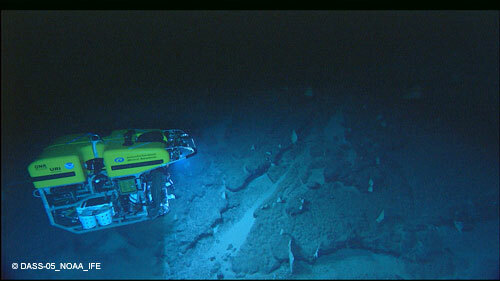 ROV Hercules working on Balanus Seamount, New England USA © DASS05_NOAA_IFE (2005) 2. 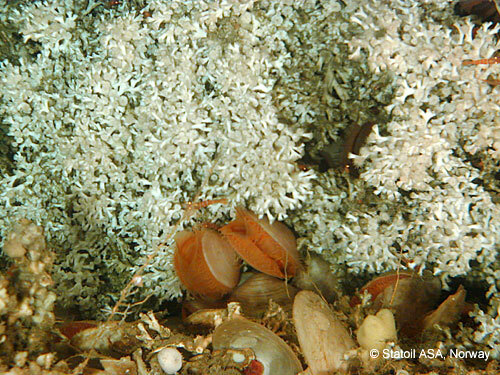 Lophelia pertusa and the clam Acesta excavata in the Kristin Pockmark field, Norway © Statoil ASA, Norway (2005). In this section we take a closer look at cold-water coral reefs around the world. They are amazingly colourful and form diverse habitats. As well as creating a home for many other species, cold-water coral reefs may also be important centres for speciation in the deep-sea. Click on the map below to visit some of the locations detailed in this section. Only in the last few decades have cold-water corals been studied in detail. In the late 19th and early 20th centuries a few cold-water coral specimens were found by fishermen and early researchers. Due to technological limitations it was impossible to learn much more about them. In recent years, with the advent of manned submersibles and deep-sea remotely operated vehicles, our knowledge has increased significantly. Navigate through this section to learn more about some of the pioneering research on cold-water corals, each section includes maps, images, videos and references to further information (follow the Go deeper links).